HP Philippines officially launched yesterday the 7-inch HP Slate 7, along with other Android-based devices such as the 21.5-inch Slate 21 All-in-One desktop PC and the 10.1-inch SlateBook 10 x2 convertible tablet. Standing out among its plastic-based counterparts, the Slate 7 espouses an aluminum-clad exterior, exuding an aura of combined elegance and durability. As its moniker suggests, the Slate 7 comes with a 7-inch touchscreen which is bordered by a black bezel and is covered with a glass panel. Although there are no physical buttons in front, the Slate 7 has touch-sensitive icons that are integrated into the user interface. These elements are intended for the Back, Home, and Menu functions. If you are looking at the device in portrait orientation, the front-facing 0.3-megapixel camera is located above the touchscreen. Based on the details that we got using AnTuTu Benchmark 3.3, the Slate 7’s display has 600 x 976 screen resolution with 160dpi and is capable of providing users with decent display legibility in normal lighting conditions. 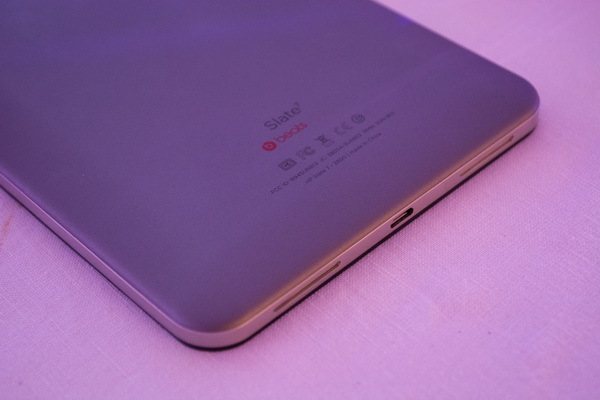 Inspecting the rear side of the Slate 7, the device has a smooth matte gray finish, which is good because it means that it does not easily attract unsightly fingerprint smudges. Located at the top left side of the back of the device is the 3.1-megapixel main camera. This positioning deviates from the usual in which the camera is located in the middle. Unfortunately, there is no flash, which means capturing photos in low light situations may be a challenging experience. 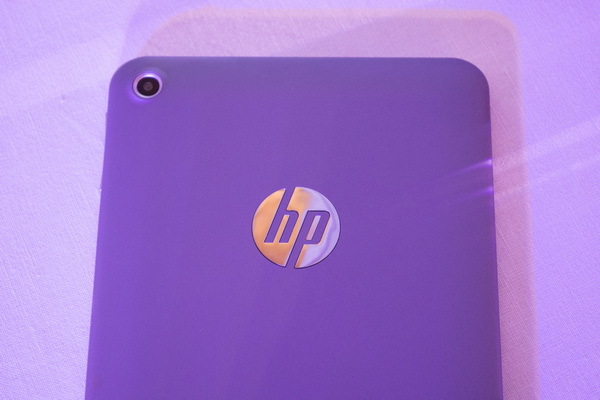 Instead of the camera, the HP logo is etched on the schema of the device. Below the back of the device, we can see the stylized Slate 7 brand along with the Beats logo. 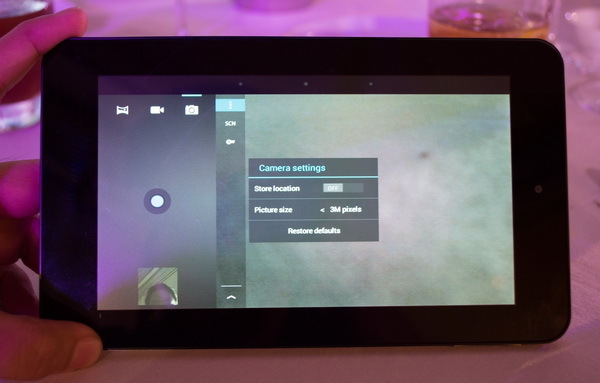 This suggests that the Slate 7 promises to offer users an audio experience that is above the ordinary. 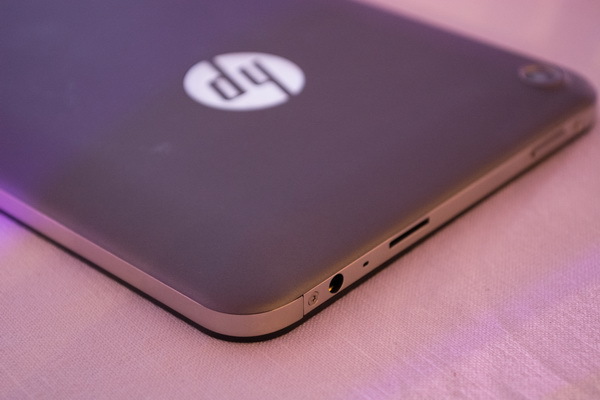 HP has been featuring Beats Audio on its notebooks and desktops, and it is now extended to tablets, such as in the case of the Slate 7. 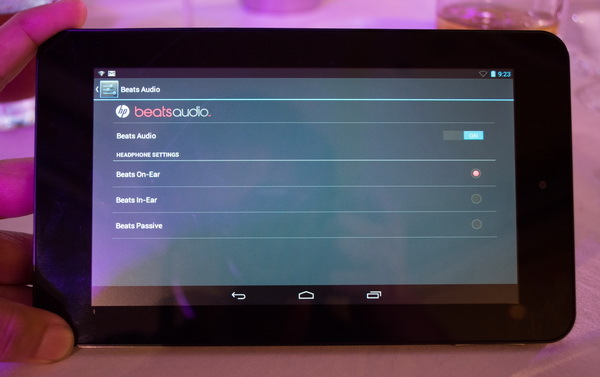 The Beats Audio feature is manifested by a separate user interface in which users can turn on Beats Audio for audio enhancement while listening to a song through headphones. Occupying the bottom part of the device is the Micro USB connector that is intended for recharging and transferring files between the tablet and another device, and vice versa. The Micro USB connector is flanked by the stereo speakers below. On top , there is the power button, volume controller, 3.5mm audio jack for headphones and external speakers, and the microSD slot for expandable storage. 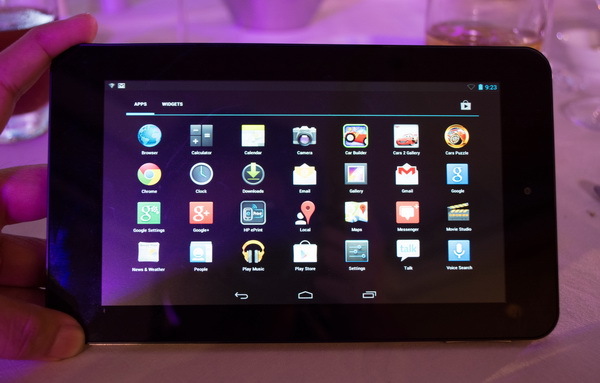 The Slate 7 fluidly runs on Android 4.1 (Jelly Bean). By simply looking at the software interface, it is hard to tell if HP has implemented any enhancements on it. We can say that in its entirety, the device uses a stock Android version. However, if you are going to dig deeper, you will discover that HP has some exclusive software utilities that are pre-installed on the device. 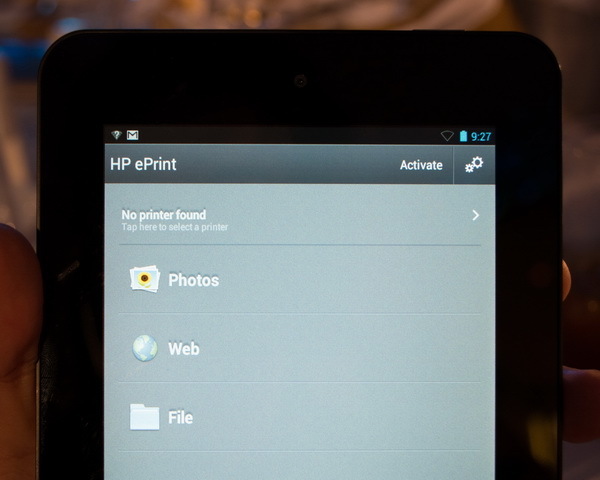 Apart from Beats Audio, the Slate 7 includes HP Print which allows for wireless printing with ePrint-compatible printers. Inside its slim confines, the Slate 7 is powered by a dual-core ARM Cortex-A9 processor (1.6GHz) with 1GB RAM and Mali-400 MP GPU. The platform is manufactured by Rockchip. Putting the Slate 7 to the test, the device got a total score of 11686 in AnTuTu Benchmark. Below is the breakdown of the score. The video below shows the Slate 7 while running the basic Ice Storm test. The following video shows the Slate 7 while running the Ice Storm Extreme portion of 3DMark for Android. 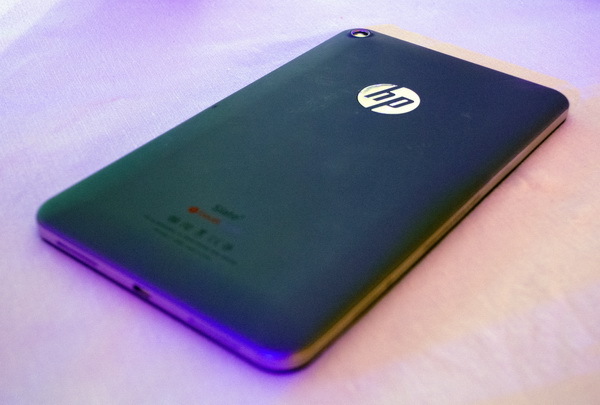 HP Philippines sells the Slate 7 for the price of PhP 7,990. 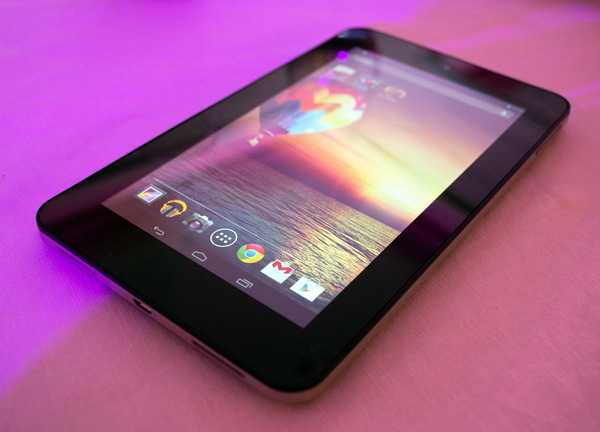 Taking into account such a reasonable price point, the Slate 7 could be a serious contender in the market which is now rife with more affordable tablet offerings. If you are a consumer who is looking for a tablet that is both easy on the eyes and easy on the pocket, the Slate 7 is may be the right model for you.